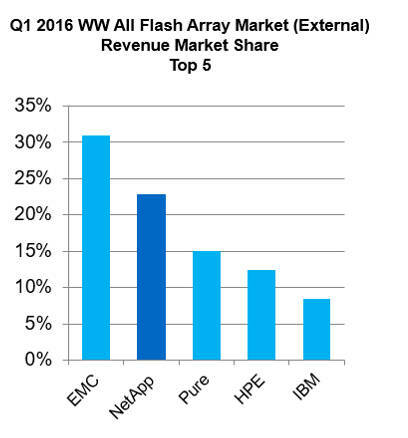 NetApp is now second in the all-flash array market, according to IDC numbers we have been given. The numbers are for vendor revenues and the first quarter of 2016. The figures show NetApp having $181.1m revenues and a 22.8 per cent share, second to EMC’s $245.6m and 30.9 per cent share. It grew its all-flash business 238 per cent from the first 2015 quarter to the first 2016 quarter. In so doing, NetApp has leap-frogged past IBM, HPE and Pure. In turn Pure has climbed up the ranks, being third behind NetApp with $139.9m revenues and a 15 per cent share. HPE is fourth at $98.6m and 12.4 per cent with IBM fifth at $67.4m and 8.5 per cent. No other supplier numbers are broken out in the numbers we have seen. If this is more than a single quarter's oddity then NetApp has returned to industry prominence with a vengeance while IBM has some serious thinking to do.